High Sensitivity Human C-reactive Protein: strong serum inflammatory marker and predictor of cardiovascular events without known cardiac disease. 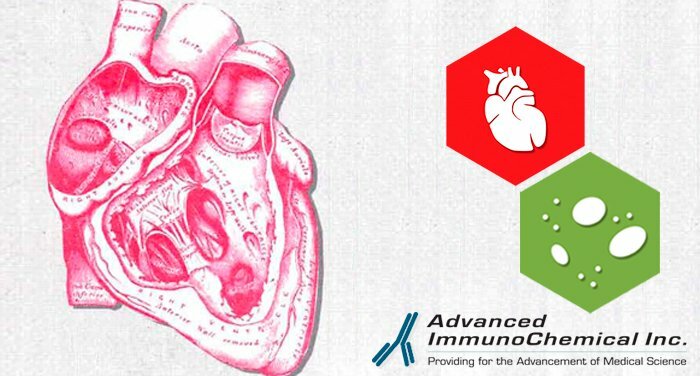 - Advanced ImmunoChemical Inc.Advanced ImmunoChemical Inc.
Home » Article » High Sensitivity Human C-reactive Protein: strong serum inflammatory marker and predictor of cardiovascular events without known cardiac disease. CRP is a 224 a.a.r. protein with molecular mass of approximately 25 kDa and a pI = 6.4 for each monomer (1). Native pentameric protein is predominantly found in plasma as a calcium dependent ligand bound by radial symmetry of five monomers forming a ring around a central core (2). High-sensitivity C-reactive protein (hsCRP) is a marker of inflammation that predicts incident myocardial infarction, stroke, peripheral arterial disease, and sudden cardiac death among healthy individuals with no history of cardiovascular disease, and recurrent events and death in patients with acute or stable coronary syndromes (3). Click here for our High-sensitivity CRP (hsCRP) AssayNotes. Advanced ImmunoChemicaloffers Anti-CRP monoclonal antibodies (MAbs) that been used in novel immunometric assays that achieve excellent sensitivity with a linear detection range of 0.025mg/L to 2.5mg/L and a detection limit of 0.004mg/L (4). Our best pairs are MAbs C2-C6 and C5-CRP135 in sandwich immunofluormetric assays using nanocrystals. Detection limit of 0.011mg/L is possible with a10,000-fold linear range (5). Important bioactivities of CRP are determined by its ability to bind a variety of ligands, such as damaged cell membranes, apoptotic cells, fibronectin, etc, with highest affinity to phosphocholine residues. When CRP is ligand-bound, it can be recognized by the complement component C1q, whereby activating the classical complement pathway (6). The CDC/AHA has identified CRP as the main inflammatory marker best suited for use to assess cardiovascular risk. It has set guidelines that support the use of CRP in primary prevention and set cutoff points according to relative risk categories (7). That’s why present day hsCRP assays are aimed at nanogram per milliliter CRP level distinction. In conventional CRP assays, turbidimetry and competitive assay techniques are often applied. In such assays relatively low affinity of utilized MAbs is usually preferable. We offer monoclonal antibodies with different affinities, allowing for utilization in different types of immunoassays. Kindly review all our Cardiac Markers at our website AdvImmuno.com. Yasojima Koji et al. “Generation of CRP and complement components in atherosclerotic plaques.” Am J Pathol. 2001 March 158(3): 1039-1051. Hirschfield G.M., Pepys M.B. “CRP and cardiovascular disease: new insights from an old molecule.” Q J Med 2003; 96: 793-807. Clearfield M.B. “CRP: a new risk assessment tool for cardiovascular disease.” JAOA 2005; 105(9): 409-416. Meyer M.H. et al. “CRP determination based on a novel magnetic biosensor.” Biosens Bioelectron 2007 Jan 15; 22(6): 973-979. Sin K.K. at al. “Fluorogenic nanocrystals for highly sensitive detection of CRP.” IEE Proc Nanobiotechnology 2006 June; 153(3): 54-58. Biro A. et al. “Studies on the interactions between CRP and complement proteins.” Immunology 2007 May; 121(1): 40-50. Ridker P.M. “CRP: a simple test to help predict risk of heart attach and stroke.” Circulation 2003; 108:e81-e85.